In a smart speaker marketshare leaderboard not yet cracked by Apple's HomePod, Google has overtaken Amazon according to new research data. 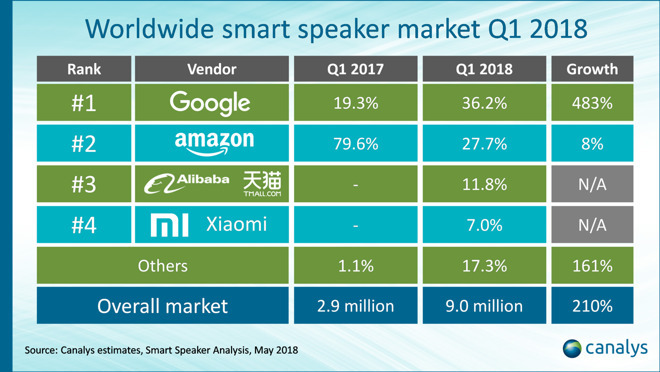 In smart speakers, a product category whose size has doubled over the course of the last year, Google has ousted Amazon as the top manufacturer in the world, according to data released Wednesday by Canalys. Alibaba and Xiaomi, a pair of Chinese brands, are third and fourth in market share. "Google has several advantages over Amazon that have helped it move ahead," Canalys Analyst Ben Stanton said in the release. "But its biggest advantage is in the channel. Operators and retailers tend to prioritize Google's speakers over those from Amazon, as Amazon is in the tricky position of being a direct competitor. But Amazon is fighting back hard, and the sheer quantity of Alexa Skills and smart home integrations will be tough for any competitor to match." Apple released the HomePod in February, and in a limited number of markets, so it hasn't yet shown up in Canalys market share rankings. An estimate this week by Strategy Analytics had Apple selling 600,000 HomePods in the first quarter, for 6 percent of the market. If the 600,000 unit figure from Strategy Analytics is accurate, that puts Apple just a hair below Xiaomi at 6.7 percent, versus 7 percent for the Chinese manufacturer. However, the products are not similarly priced. The HomePod is priced at $349, while the Amazon speakers are much less, including the $50 Amazon Echo Dot. The Google Home line also has high- and low-end models.